A lubrication system for the plunger of a die cast machine is disclosed that does not require a timing mechanism or an additional pressure source for the lubricant. The forward stroke of a lube piston is used to force lubricant out of a lubrication chamber in the plunger through a passageway to the outer surface of the plunger by decreasing the volume of the lubrication chamber. A spring within the plunger's lubrication chamber is used to retract the piston and thereby increase the volume of the lubrication chamber. The relatively low pressure during this retraction stroke allows lubricant to flow from a lubricant tank into the lubrication chamber for distribution during the next forward stroke of the plunger. World class foundry MRT Castings has launched an ambitious strategy to double its production capacity over the next three years. The die casting specialists – who offer complete end-to-end manufacturing solutions – are experiencing significant growth in their key niche markets. Successful improvement activities are about taking common sense ideas from every level of the team and developing them to add value throughout the business. The die casting specialists – who offer complete end-to-end manufacturing solutions – are experiencing significant growth in their key niche markets. MRT is growing the workforce at its manufacturing facility in Andover, Hampshire to cater for new projects in the medical electronics, aerospace and defence sectors. The company has also been investing in new capital equipment, including a new Colosio PF250 die casting cell with real-time shot control to ensure consistent high quality production. Its facilities are also being enhanced by the addition of two further Brother S2DN-0 high speed machining centres in December. 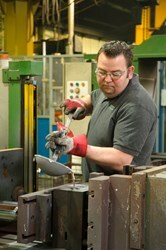 Further growth in production will come by evolving the world class manufacturing practices already in action at MRT. Managing Director Phil Rawnson has just returned from a fact-finding mission to Japan to study the latest techniques and see how lean manufacturing is applied in some of the most productive manufacturing facilities in the world. He intends to “accelerate MRT’s lean journey” after touring production plants in Tokyo and Kyoto. “Lean manufacturing has been a part of MRT’s processes for many years,” he said. “My trip to Japan has provided an amazing insight into how the Japanese operate their leading production sites to world class standards by empowering staff, investing in technology and creating a culture of continuous improvement. “Successful improvement activities are about taking those common sense ideas from every level of the team and developing them to add value throughout the business,” he added. Evidence of these improvement activities is already apparent throughout the business. MRT has optimised its set up routines so it can cast aluminium components in lower volumes more cost effectively than its competitors. Quality is at the core of all of MRT’s activities with 100 per cent of production receiving cosmetic inspection prior to shipment. Dimensional control is ensured by two CNC co-ordinate measuring machines and advanced SPC. Through this systematic quality control, waste can be reduced to deliver lean manufacturing – 5S techniques and visual management are also used throughout all production areas. Customers can also work alongside MRT’s engineers on the design of their products. This helps to cut out waste from the start, making production as lean as possible. MRT offers established customers Kanban-triggered delivery systems to schedule lean and just-in-time production across all of the processes involved in high pressure casting, gravity die casting and CNC machining. MRT Castings provides its customers with full turnkey manufacturing solutions including design, tooling, painting and plating. The company can also assemble, store and ship customers’ products directly to their clients – a complete and seamless outsourced service. MRT has also implemented a lean energy management system to save energy on the production floor by monitoring energy consumption on every production cell. The company has set energy reduction targets as part of its ISO14001 accredited environmental management system. For further details about die casting, please contact MRT Castings Sales Director Chris Rawnson on +44 (0)1264 324021. MRT is a privately owned family business that has continually invested in the latest technology and training to ensure it has one of the most highly skilled teams and the most advanced manufacturing facilities in the UK foundry industry. MRT is a gravity and high pressure die casting company accredited to ISO9001:2008 and ISO14001:2004. If you like this article, learn more about Hill and Griffith's attendance at the Die Casting Congress Trade Show. The Hill and Griffith Company is known for our hands on approach. Let us visit your plant and recommend foundry supply products that suit your needs.